Pan seared lemon pepper chicken thighs are made in a skillet and make an easy weeknight dinner in under 30 minutes! 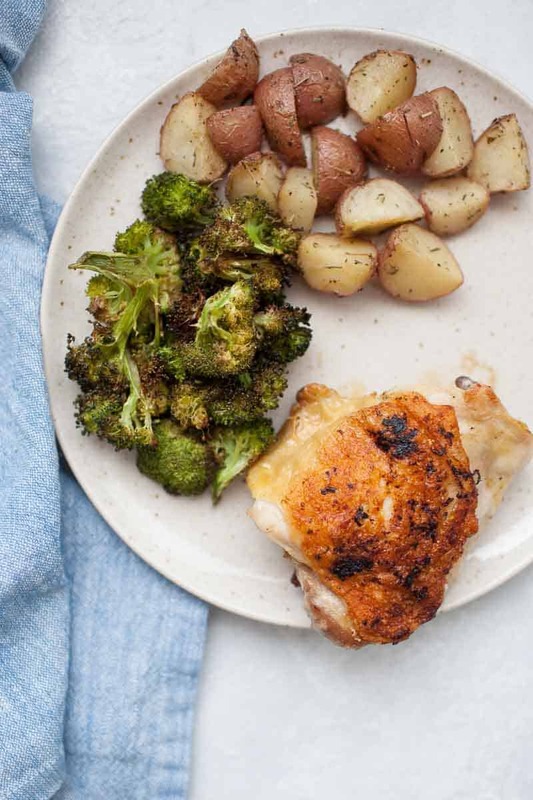 Serve it with your favorite roasted veggies and you’ll have a meal your whole family will love! This post contains affiliate links. Affiliate links support A Joyfully Mad Kitchen at no additional cost to you. I receive a commission if you choose to make a purchase through these links. I went through a phase during this last pregnancy where I wanted chicken thighs all the time. If you go back a few years, I wouldn’t have touched trying to cook chicken thighs with a ten foot pole. Plus, I didn’t really enjoy the process of eating them either, so I just stuck the idea in my back pocket for the time being. 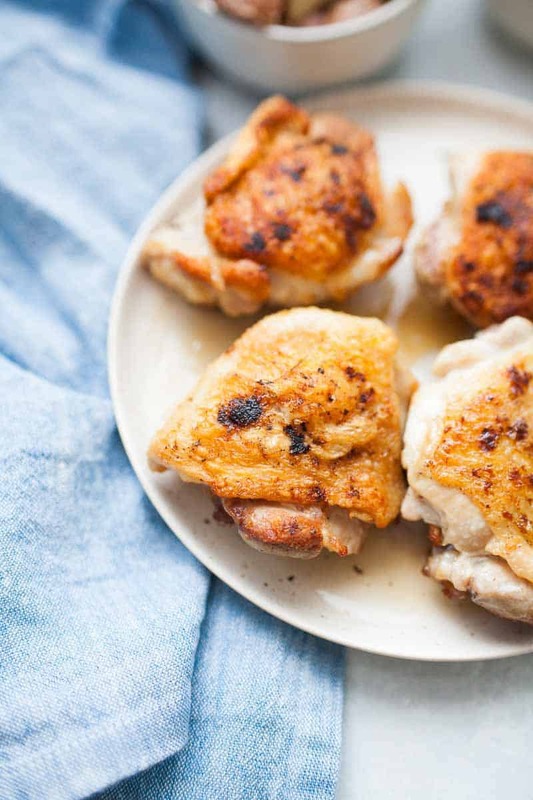 Now, eating chicken thighs is an almost weekly occurrence for us. Why bone in chicken thighs? Bone in chicken thighs are cheaper, but still have a lot of meat on each piece. They have the skin on, which makes them nice and crispy, if cooked correctly. Because the thighs are bone in, they’re really hard to dry out even if overcooked. This means you can err on the side of caution when cooking a recipe for bone in chicken thighs and cook them a bit longer if you’re feeling nervous about them cooking through and you still won’t dry out the meat. 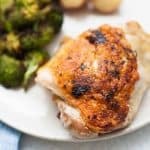 How do you get crispy skin on chicken thighs? If you follow these steps, you’ll find that the skin on your bone in chicken thighs is nice and crispy every time! Trim and clean the chicken thighs, removing any excess skin that is not covering the meat. Use a dry rub of spices all over the chicken. Cook by pan searing the chicken in a skillet or baking in the oven. If baking in the oven, you can layer an oven proof wire cooling rack on top of a baking sheet which will help the chicken get crispy! Broil for the last few minutes to really crisp up the skin! Can you cook these in the oven? Sure, cooking time will vary a bit. I’d check after about 20 minutes with a meat thermometer to check the internal temperature. If it’s not cooked to 165°, continue cooking 2-3 minutes at a time until cooked. What is in lemon pepper seasoning? Lemon pepper seasoning is cracked pepper, lemon zest and salt. It’s so easy to make homemade! 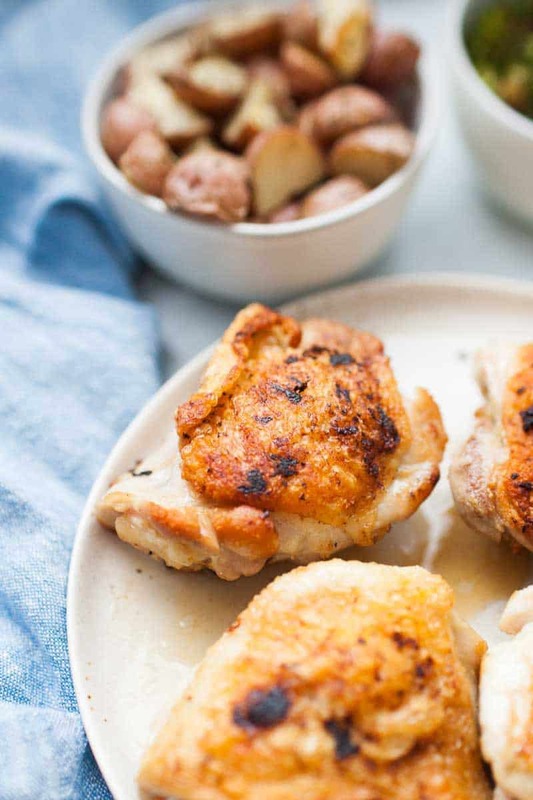 Can you use boneless chicken thighs or breasts? Absolutely. You won’t get the crispiness of the chicken skin from the bone in thighs, but you’ll still get the tenderness of the meat. I’d recommend pounding the chicken breasts thin or cutting in half through the center of the breast to make sure the cook time is a bit more even. Be sure to watch your cook time, so you don’t overcook the meat. 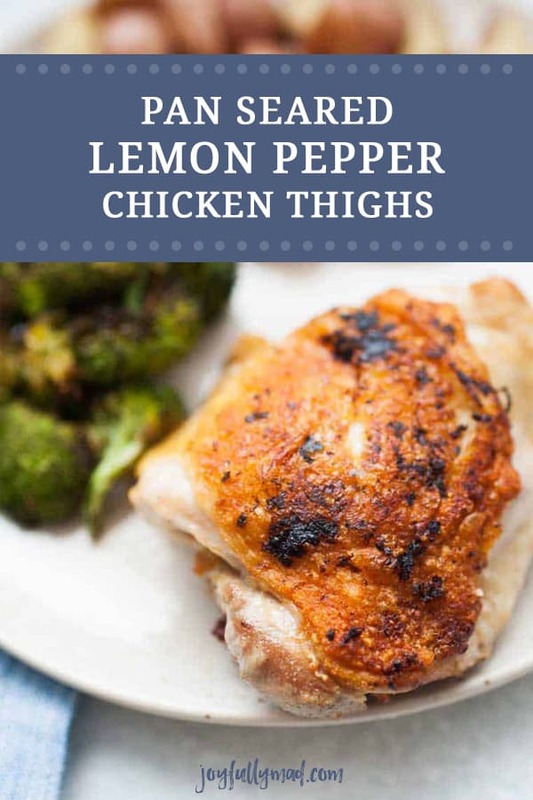 How do you make Lemon Pepper Chicken Thighs? Trim any excess skin off of chicken thighs. Mix together your homemade lemon pepper seasoning: 2 teaspoons each of salt, pepper, and lemon zest. 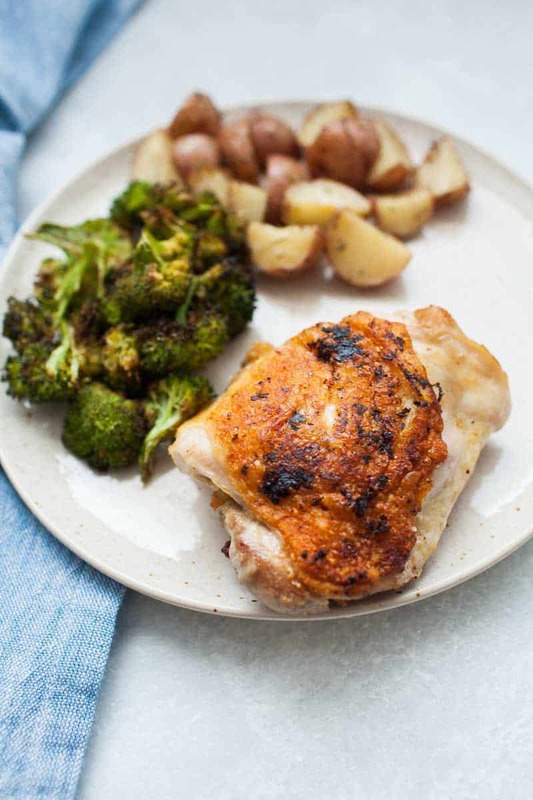 Generously cover both sides of the chicken thighs with the lemon pepper seasoning. In a skillet, add olive oil to bottom of pan and heat until hot, but not smoking. Place the skin side of the chicken thigh down first. Sear that side for 3 minutes. You’ll know that side is ready to flip once you notice that it’s easy to pull off the heat of the pan. If it’s sticking, give it a little more time. Once you flip the chicken to the side without the skin on it, cover your skillet. Continue cooking chicken, covered, for about 10 minutes. Use a meat thermometer to check the internal temperature by sticking the probe of the thermometer into the meat, close to the bone. When the thermometer reads 165, your chicken is cooked. 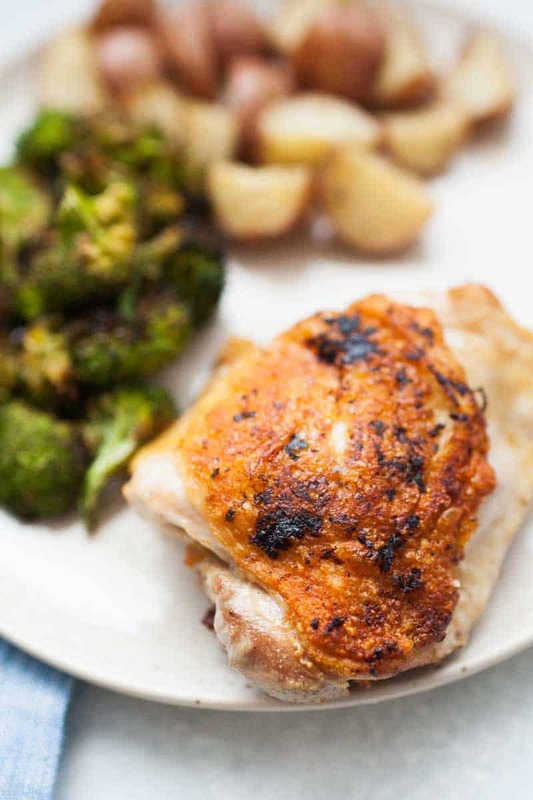 With bone in chicken thighs, you can err on the side of “overdone” if you’d like and cook it to 170-175 without drying out the meat. Bone in thighs regularly have some redness right by the bone, but the rest of the meat is perfectly cooked. What should I serve Lemon Pepper Chicken Thighs with? The best part about chicken is it goes with so much! Try pairing with Oven Roasted Broccoli, Sweet Potato and Kale Sauté or a fresh Strawberry Vinaigrette Spinach Salad. Trim any excess skin off of chicken thighs and pat dry with a paper towel. Mix together your homemade lemon pepper seasoning. Place the skin side of the chicken thigh down first. Sear that side for 3 minutes. Perfectly done and really tasty. The hubby gave it a thumbs up – which is hard to do sometimes. That is quite the compliment 🙂 So glad you liked it!